The soccer news starts with Real Madrid joining in the modern stadium movement. The Spanish giant plans to spend around $590m to revamp the Bernabeu turning it into what club president Florentino Perez is calling " a great avant-garde and universal icon" and "the best stadium in the world." 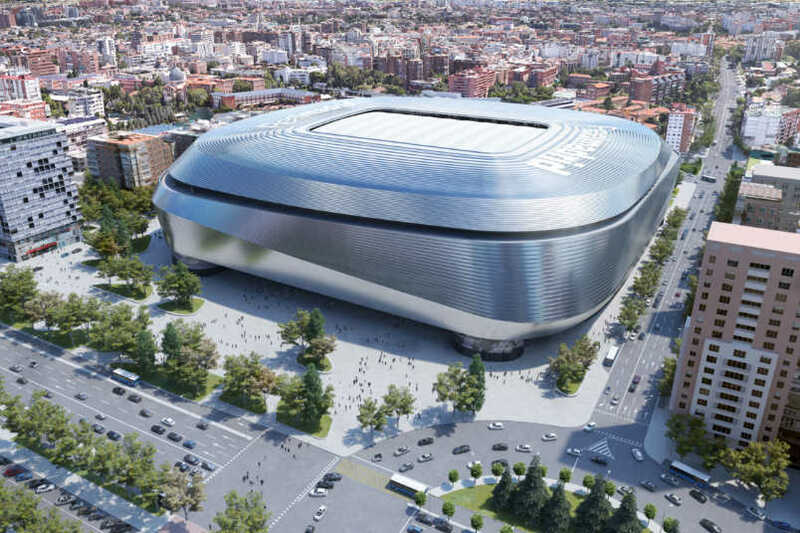 "This great project will become a key piece for the Real Madrid of the future, but also for the city of Madrid," Perez said. "And it will be because the new Santiago Bernabéu stadium, located in the heart of Madrid, will be the best stadium in the world. More modern, more comfortable, safer and designed for entertainment, with new areas of leisure and catering and where the most advanced technology will be key for fans to live new experiences." It's an interesting idea for a major European city where stadiums rarely take pride of place. Barcelona's Camp Nou might have close to 100,000 seats but it blends into its neighborhood. London might have multiple major stadiums, but none of them fight for space in the center of the city. PSG's Parc des Princes isn't in the tourist area of Paris and neither is the Stade des France on the outskirts of the city. Putting the stadium at the periphery is also the case in places like Rome, Milan, and Berlin. It's the same situation in the soccer capitals Turin, Manchester, and Munich. The Bernebeu isn't in the city center either, but what the club is describing is the type of mixed-used urban core development more associated with North American sports leagues. How that works in Europe is still an open question even if it's the established model all over the United States and Canada. Also in the soccer news, Timothy Weah scored the opening goal in Celtic's 2-0 shutout at St Mirren. Weah's goal came in the 15th minute with Ryan Christie doubling the lead in the 85th. Weah subbed out in the 78th minute. Scott Bain needed one save to keep the clean sheet. Celtic has a 13-point lead in the Scottish Premier League after 32 games. "It can be a cliche, but we’re at the business end of the season and it’s all about getting over the line," Christie said. "We take it one game at a time and we’re focused on getting three points every time. There were times against St Mirren where we might have pushed on and got some more goals, but the important thing is scoring, keeping a clean sheet and getting three points." Lynden Gooch's Sunderland shutout Accrington Stanley 3-0 away in League One. Aiden McGeady opened the scoring in the 4th minute with Will Grigg making it 2-0 in first-half stoppage time. Kazaiah Sterling scored in the 79th minute. Sunderland is in 3rd-place in League One with 76 points, trailing 2nd-place Barnsley by two points but with 38 games played to Barnsley's 40. Luton Town leads the league with 86 points from 40 games. Andrija Novakovich subbed out in the 89th minute for Fortuna Sittard's 0-0 home draw with ADO Den Haag. Fortuna Sittard played a man down from the 32nd minute with a red card to Jose Martinez. Fortuna is 14th in the Eredivisie table, tied on points with 13th-place ADO Den Haag. Erik Palmer-Brown's NAC Breda won 2-1 at Excelsior. Trailing from the 30th minute, Giovanni Korte equalized in the 67th. Menno Koch scored NAC's winner three minutes into stoppage time. NAC is last in the Eredivisie, four points out of the relegation playoff spot and five points from safety. In the Concacaf Champions League, Tigres took a 3-0 lead over Santos Laguna in their semifinal series. Eduardo Vargas put Tigres up at home in the 8th minute with Enner Valencia scoring in the 27th and 37th. The Athletic's Pablo Maurer reports on the contract situation for DC United player Luciano Acosta. SBI Soccer's Franco Panizo looks at the attendance issues at Red Bull Arena. Football DNA makes the case that there's a Premier League Big Five and that it doesn't include Spurs. The Irish Times' Barney Ronay on the opening night at Tottenham Stadium. The NY Times' Rory Smith takes in Spurs' opening night win.